The Changing Face of Elephant & Castle exhibition, jointly organised by the Borough Road Gallery, London South Bank University (LSBU) Archives and Southwark Local History & Archives, will shed light on 125 years of the area’s history. The free exhibition ties in with the national launch of the Explore Your Archive campaign, which aims to bring communities together to share amazing stories from the past. Coinciding with the University’s 125th anniversary, visitors will see artwork by famous British painter and former LSBU teacher David Bomberg, as well as art owned by Southwark Council which is not ordinarily displayed. LSBU archivist Ruth MacLeod said the exhibition would highlight some of the way the University has contributed to the local community since it opened as Borough Polytechnic in 1892. “This exhibition will showcase the changes to Elephant & Castle over the 125 years that LSBU has been based in the area,” she said. Southwark Heritage Services archivist Patricia Dark said the Elephant & Castle had always been a dynamic and interesting part of London. “The Elephant & Castle has been where London meets the world since Roman times: a transport hub, entertainment centre, and shopping destination where communities met and mingled,” she said. 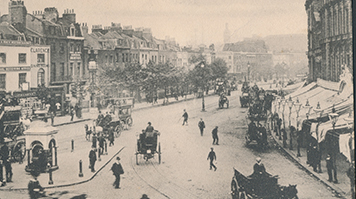 Image: Newington Causeway in 1906. Courtesy of Southwark Council.